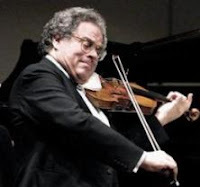 Itzhak Perlman is an Israeli violinist, teacher, and conductor born on August 31, 1945 (Heifetz was 43 years old.) He is at the forefront of virtuosos (Zukerman, Kremer, Mullova, Wha Chung, Midori, Laredo, Accardo, Fodor, etc.) who came after the early Twentieth Century era of violinists – Kreisler, Milstein, Gitlis, Heifetz, Elman, Szeryng, Zimbalist, Oistrakh, Kogan, Haendel, Francescatti, Ricci, Ferras, Stern, Grumiaux and others. In addition to a golden tone and an impressive, seemingly effortless technique, he is known for having a good bass voice and a charismatic stage presence. He first took up the violin at age 5 while living in Tel Aviv, Israel. He came to the U.S. in 1958. Winning a scholarship, Perlman attended the Juilliard School of Music (New York) where his teachers were Ivan Galamian and Dorothy Delay. Today, he teaches in their place. His U.S. debut (at Carnegie Hall) took place in 1963 and Perlman has been concertizing, recording, and making television appearances ever since. In addition, as most concert artists of today do, he frequently plays chamber music. His conducting work is mostly done with the Detroit Symphony and the Westchester Philharmonic. Perlman has a profile page on MySpace and YouTube features lots of videos of his playing. A particular favorite of viewers is the Handel Halvorsen Passacaglia (with Pinchas Zukerman on viola.) Perlman plays the Soil Stradivarius of 1714, previously owned by Yehudi Menuhin.